EXTREMELY FINE GEM. 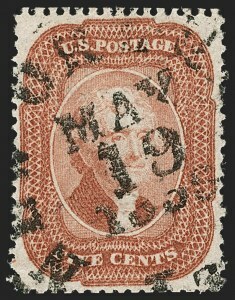 A SUPERB USED EXAMPLE OF THE 1857 5-CENT BRICK RED. 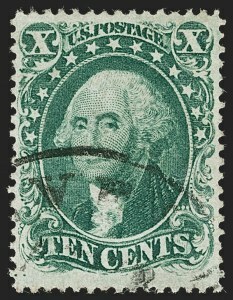 EASILY ONE OF THE FINEST EXAMPLES IN EXISTENCE -- THIS REMARKABLE STAMP IS GRADED XF-SUPERB 95 BY P.S.E., WHICH IS THE HIGHEST AWARDED. Ex "Tahoe" and Merlin. With 2011 P.S.E. certificate (XF-Superb 95; SMQ $14,500.00). This is the highest grade awarded and only five others share this grade. This is the first in this grade we have offered since 2013. EXTREMELY FINE GEM. 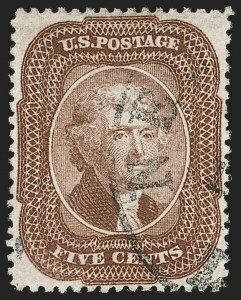 A STUNNING USED EXAMPLE OF THE 1857 5-CENT RED BROWN, GRADED SUPERB 98 BY P.S.E. -- THIS IS THE HIGHEST GRADE AWARDED AND IT IS SHARED BY ONLY ONE OTHER. THIS IS ONE OF THE MOST DIFFICULT ISSUES TO OBTAIN WITH SUCH WIDE MARGINS AND IN SUCH PRISTINE CONDITION. 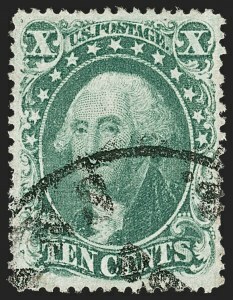 Due to the narrow spacing between stamps on the plate, the perforations often touch or go into the outer portion of the design on one or more sides. 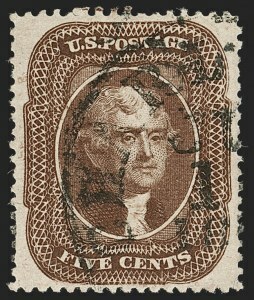 The example offered here, with perfect centering and deep rich color, is a true condition rarity. Ex Kirke. With 2000 P.F. and 2010 P.S.E. certificates (Superb 98; SMQ $29,000.00). This is the highest grade awarded and only one other example has achieved this grade, a statistic that has not changed since 2010. EXTREMELY FINE. 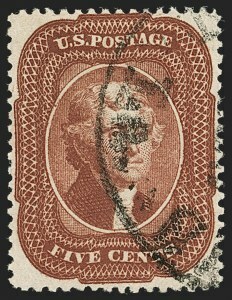 A FRESH AND CHOICE USED EXAMPLE OF THE 1857 5-CENT RED BROWN. EXTREMELY FINE GEM. A BEAUTIFUL USED EXAMPLE OF THE 1857 5-CENT INDIAN RED, WITH STUNNING COLOR, FRESH PAPER AND LONG AND FULL PERFORATIONS ALL AROUND. A DIFFICULT STAMP TO FIND IN SUCH CHOICE CONDITION. The deepest shade of Red Brown from the 1858 printing is known as Indian Red. It is found in a short spectrum of color, ranging from a dark purplish shade to a vivid "glowing" orange shade. 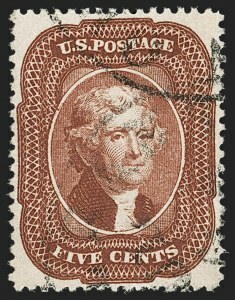 To be classified as Indian Red, the stamp's impression must be strong throughout, especially in the area of the oval surrounding Jefferson's head. 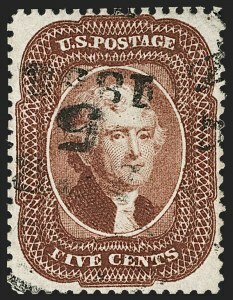 If a stamp possesses anything less than a very deep impression with the characteristic intense red shade, it will fall short of Indian Red, Scott 28A (and that is why Scott 28b was created as "second place"). Ex Merlin. With 2005 P.S.E. certificate (XF 90; SMQ $8,000.00). Only one has graded higher (at 95) and five others share this grade. This is the first in this grade we have offered since 2012. EXTREMELY FINE GEM. AN OUTSTANDING USED EXAMPLE OF THE 1859 5-CENT TYPE I BROWN IN THE FINEST ATTAINABLE CONDITION. 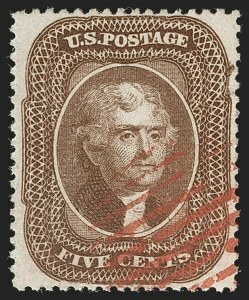 THIS STAMP IS GRADED SUPERB 98 BY P.S.E. -- THIS IS THE HIGHEST GRADE AWARDED AND IT IS SHARED BY ONLY ONE OTHER. 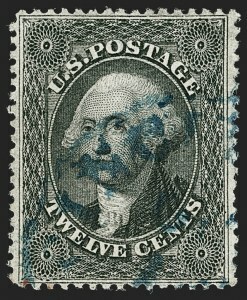 Due to the narrow spacing, many examples have the outer projections touching or in to the perforations. The example offered here is a notable exception. EXTREMELY FINE GEM EXAMPLE OF THE 1861 5-CENT TYPE II. Ex Merlin. With 1999 and 2004 P.F. and 2005 P.S.E. 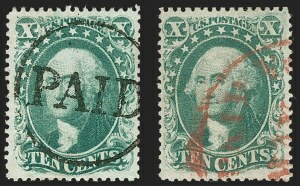 certificates (XF-Superb 95; SMQ $2,800.00). Only three have graded higher -- one each at 95J (we have never offered it), 98 (ex Bowman, realized $14,500) and 100 (ex "Natalee Grace", realized $18,000). This is the first in this grade we have offered since 2012. EXTREMELY FINE GEM. THIS MAGNIFICENT USED EXAMPLE OF THE 1857 10-CENT PERFORATED TYPE I IS GRADED XF-SUPERB 95 BY P.S.E. -- THIS IS THE HIGHEST GRADE AWARDED. 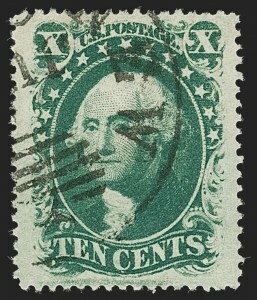 Type I stamps only come from the 20 positions that comprise the bottom row of the plate. Due to narrow spacing on the plate and difficulties in aligning the perforating machine, stamps at the bottom of the plate usually have perforations cutting into the bottom portion of the design. This is a negative, because Type I is defined as having the design complete at bottom. 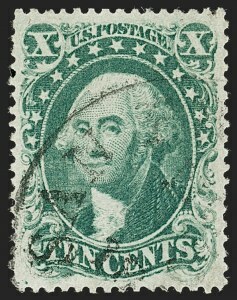 The population of stamps showing the characteristic is extremely limited, especially when other factors such as soundness are taken into consideration. Ex Merlin. With 2007 P.S.E. certificate (XF-Superb 95; SMQ $12,500.00). This is the highest grade awarded and only five others share it, a statistic that has not changed since 2013. This is also the first in this grade we have offered since 2012. EXTREMELY FINE GEM. A PHENOMENAL EXAMPLE OF THE 1857 10-CENT TYPE II, GRADED SUPERB 98 BY P.S.E. -- THIS IS THE HIGHEST GRADE AWARDED. Ex Dauer and Merlin. With 2004 P.F. and 2008 P.S.E. certificates (Superb 98; SMQ $11,000.00). This is the highest grade awarded and only one other shares it, a statistic that has not changed in a decade. EXTREMELY FINE GEM. THIS IS EASILY ONE OF THE FINEST USED EXAMPLES OF THE 1857 PERFORATED 10-CENT TYPE III IN EXISTENCE. THIS STUNNING STAMP IS THE ONLY EXAMPLE AWARDED THE GRADE OF SUPERB 98 BY P.S.E., WHICH IS THE HIGHEST GRADE AWARDED. 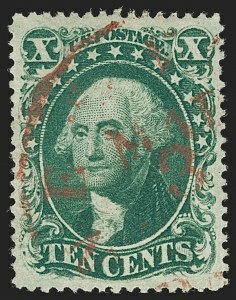 The first perforated 10c stamps produced by Toppan Carpenter from sheets printed from Plate 1 are notorious among collectors for their poor centering. The example offered here, with unusually wide margins on all sides, bright color, a face-free cancel and in pristine condition, is the finest we have ever encountered. Ex "Natalee Grace". With 1999 P.F. and 2009 P.S.E. certificates (Superb 98; SMQ $12,000.00). This is the highest grade awarded and the only example to achieve this grade. EXTREMELY FINE GEM. THIS SUPERB USED EXAMPLE OF THE PERFORATED 1857 10-CENT TYPE IV IS GRADED XF-SUPERB 95 BY P.S.E. -- THIS IS THE HIGHEST GRADE AWARDED. 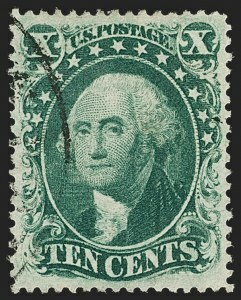 10c Type IV stamps are defined by the recut of one or both outer lines at the top or bottom of the design. 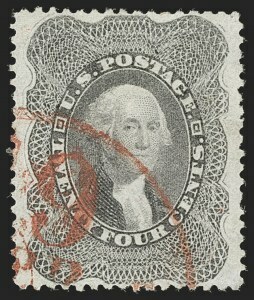 Type IV stamps come from only seven scattered positions on the left pane and one position on the right pane of Plate 1. 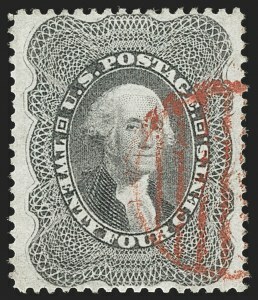 Therefore, only 4% of the stamps from Plate 1 are Type IV, and since their population is low they are difficult to find with such choice centering. Ex Merlin. With 2008 P.S.E. certificate (XF-Superb 95; SMQ $15,000.00). This is the highest grade awarded and only three others share it. We have not offered another in this grade since 2012. EXTREMELY FINE GEM. THIS SUPERB USED EXAMPLE OF THE 12-CENT 1857 ISSUE FROM PLATE ONE IS GRADED SUPERB 98 BY P.S.E. -- THIS IS THE HIGHEST GRADE AWARDED. Due to narrow spacing on the plate, most examples of this stamp have perforations touching at least part of the outer frameline of the design. The example offered here has far wider margins than most. Ex Merlin. With 1989, 2003 and 2007 P.F. and 2009 P.S.E. certificates (Superb 98; SMQ $10,000.00). This is the highest grade awarded and only three others share it. This is the first we have offered in this grade since 2012. EXTREMELY FINE GEM. 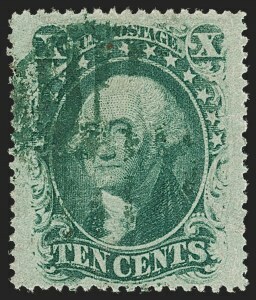 A SUPERB USED EXAMPLE OF THE 12-CENT 1860 ISSUE FROM PLATE 3, GRADED XF-SUPERB 95 BY P.S.E. Ex Merlin. With 2011 P.S.E. certificate (XF-Superb 95; SMQ $2,000.00). Only one has graded higher (at 98, offered in our "Natalee Grace" sale). EXTREMELY FINE GEM. 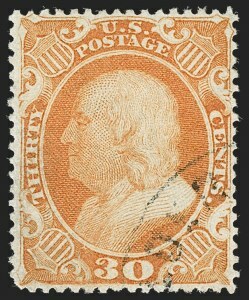 A SUPERB USED EXAMPLE OF THE 24-CENT 1860 ISSUE, GRADED SUPERB 98 BY P.S.E. -- THIS IS THE HIGHEST GRADE AWARDED. Ex Merlin. With 2009 P.S.E. certificate (Superb 98; SMQ $8,500.00). This is the highest grade awarded and only five others share this desirable grade. EXTREMELY FINE GEM. A SUPERB USED EXAMPLE OF THE 30-CENT 1860 ISSUE. AN EXCEEDINGLY DIFFICULT ISSUE TO FIND IN SUCH SUPERB CONDITION. THIS MARVELOUS STAMP IS EASILY ONE OF THE FINEST IN EXISTENCE. IT IS GRADED SUPERB 98 JUMBO BY P.S.E. -- THIS IS THE HIGHEST GRADE AWARDED AND THE ONLY EXAMPLE TO ACHIEVE IT. The narrow space between subjects on the plate makes it almost impossible for the perforations to clear the design on all four sides. 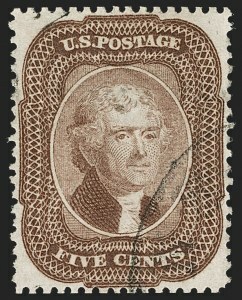 The example offered here, with extra wide margins at sides and perfs clear at top and bottom, is a true condition rarity. Ex Senchuk and Merlin. With 2009 P.S.E. certificate (Superb 98 Jumbo; SMQ $9,000.00). 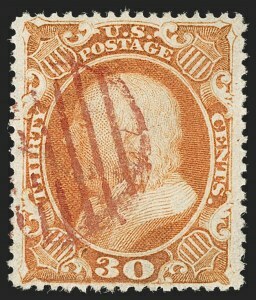 This is the highest grade awarded to a Scott 38 in any category (unused or used), and it is the only example to achieve this grade. 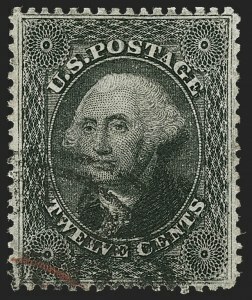 1c-24c 1851-57 Issues, Choice Used Balance (9/37a). 12 used stamps, including Nos. 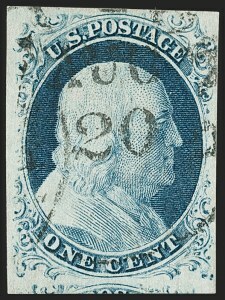 9, 10, 11, 11A (two), 20 (two), 25, 35, 36, 36B and 37, each is a sound stamp with a handstamp cancel, including blue on No. 36B and red on No. 37, bright and fresh throughout, Very Fine-Extremely Fine, each with at least one P.F. certificate from the early 2000s, No. 11A graded XF 90 by P.S.E.